When it comes to rules in kitchen hardware, really there are few rules. Following the alleged “Golden Mean” makes an aesthetically pleasing space and is a great place to start, but ultimately ends with what appeals to you. Maybe you’re looking at pulls, and the largest size only comes in 6″, and you love them so much that you go for it. That would be great too. Much of this rests in personal preference. Do you appreciate the look of two pulls per drawer on wider drawers? If so, you could get all one size and put one on drawers less than, say, 30″ and two on any 30″ or wider. You usually do not have to worry about pulling a drawer unevenly with two pulls. As long has you have good quality drawer hardware and solid drawer slides, you shouldn’t have any problems. Not every style of pull is available in the larger sizes you may desire for your revamp design project. If you absolutely require the larger sizes, you can mix and match, but choose your style carefully. Larger pulls can get spendy, so keep that in mind when looking. 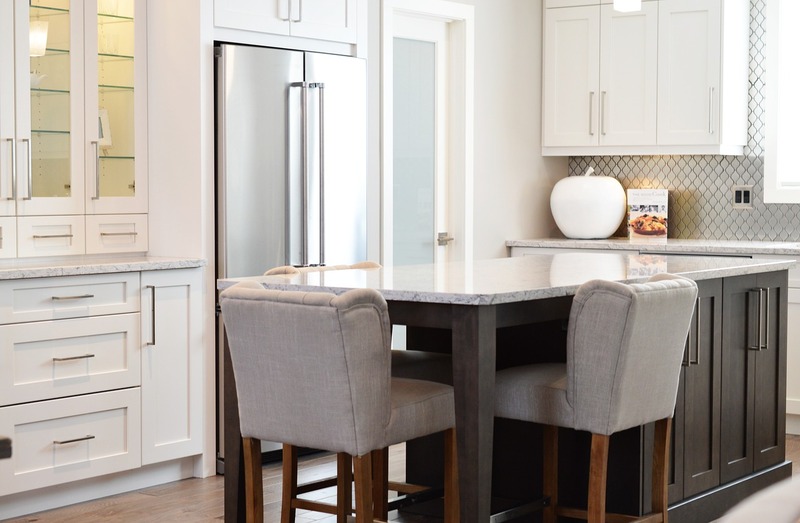 What is the style of the kitchen cabinets and drawers currently in place? Shaker? If so, you could follow the “Golden Mean” with just the flat panel part of the drawer (the part inside the stiles/rails). You can utilize shorter pulls that way, and save some cash. Many homeowners seeking the quick upgrade will use two pulls on all drawers greater than 27” in size, using knobs or smaller pulls everywhere else. On larger, deeper drawers, where you might store pots and pans, or heavy glass or ceramic dishes, two pulls will help alleviate stress on your drawer slides, thus lessening the necessity of replacing that hardware before its time. If you really prefer the look of one pull per drawer, most will actually look fine on most drawer widths. We recommend choosing a medium-sized pull and just using the same size throughout your project. You really can complicate things for yourself by scouring the net and stores looking for the same pull in various sizes. When we talk about the “Golden Mean,” we are addressing the theory as it relates to drawers that a pull is most aesthetically pleasing if it measures 1/3 the width of the drawer and leaves 2/3 (1/3 on either side of the pull) uncovered. Here’s where things can get a little tricky: What if your drawer stacks aren’t all the same width? You’ll have to choose to vary the pull length on your drawer stacks to keep the Rule of Thirds consistent. That could mean finding a pull that comes in several lengths. What are your cabinets and drawers made of? What kind of finish are you working with? And what kind of finish for your hardware is likely to compliment that finish the best. 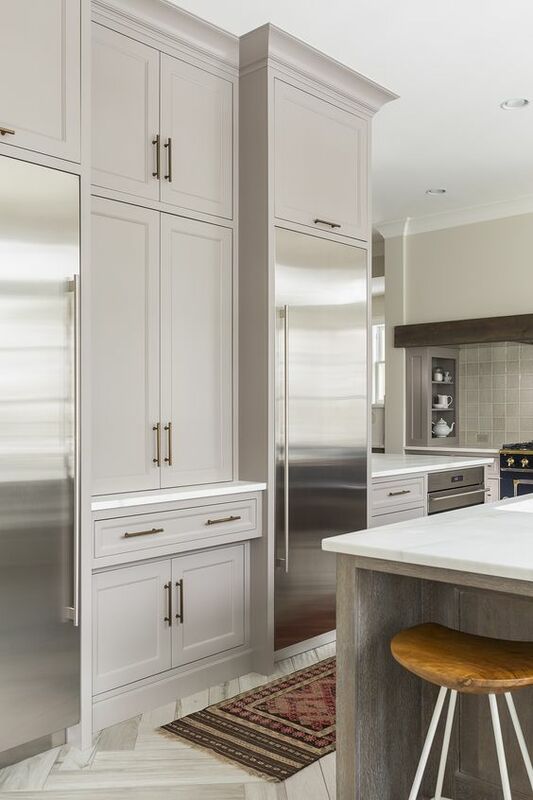 We see a strong desire, frequently, to lean toward brushed nickel hardware to match stainless steel appliances, in a kitchen with the very popular cherry cabinets. The reality is that oil-rubbed bronze is much more complimentary to cherry cabinets. 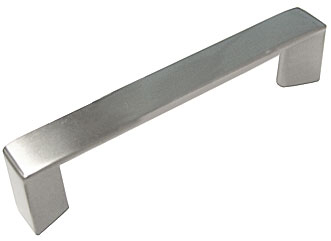 Chrome doesn’t match stainless, but it does “go” with it, and is a nice finish. Don’t feel that you must match every finish in the room. 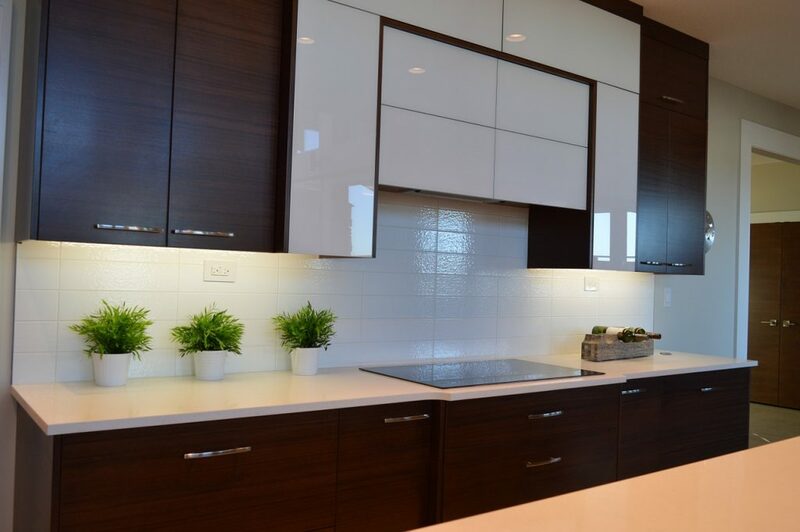 There are many interesting finishes that work with different cabinet finishes and styles. Keep an open mind, and get yourself some samples to try before you buy. You can go to Home Depot and Lowes, and look at their display kitchens to compare hardware finishes to what might work for you and your design aesthetic. Lots of homeowners simply don’t like the look of two pulls on wide drawers; they think it’s too busy. This is a consideration to look at if you have both wide and narrow stacks and choose to utilize the same size pulls on all of your drawers. Whatever you ultimately choose, we suggest only purchasing two or three of them and them mocking them up on your drawers to see which look resonates with you most strongly, how you want the placed on the drawer fronts, and whether they fit well in your hands. The bottom line is this … what draws your eye? What is YOUR aesthetic? That will tell you a lot about how you should place your hardware.